With all of the winter weather conditions surrounding our forecasts, hazardous conditions are nothing less than expected. One such hazard that is commonly overlooked until it is too late is tree damage. Strong winds, heavy snow, and thick ice can cause a tree to uproot from the ground, and eventually, topple over. Many people wake up in the morning to find their homes or structures damaged by a fallen tree. A common victim: vehicles. So what do you do if you wake up to find your car or truck underneath a storm-stricken tree? Continue reading to learn. What’s Your Insurance Look Like? Your options as far as getting compensated for your vehicular damages depend mostly on what type of insurance coverage you have. If you have the state-minimum liability car insurance, you may not be able to make a claim. If you have comprehensive insurance coverage, and the policy is in good-standing before the incident, you should be covered. 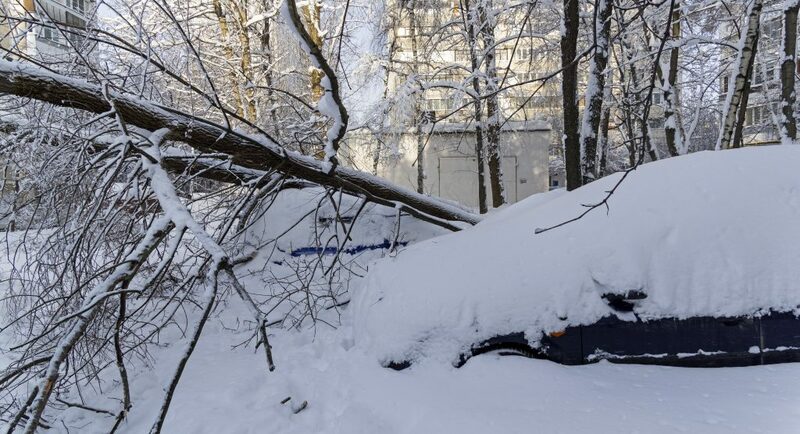 Comprehensive automotive insurance coverage should cover all damages done to a vehicle so long as the tree fell as a result of snow, wind, or other natural element. If the tree fell because you cut it down improperly, for instance, it may not be covered by insurance. Although unrelated to trees, this type of insurance tends to cover hail damage, as well. When a comprehensive insurance policy compensates a driver for vehicular tree damage, they provide funds to cover the cost of repairs, minus the policy deductible. If the cost of repairs exceeds the current market value of the vehicle make and model, the insurance company will deem the vehicle a total loss. Read our blog, “When is a Car Totaled?” to learn how to calculate a total loss vehicle. In the case of a total loss vehicle, the insurance company will pay to replace the car with one of equivalent make, model, and condition. If a person does not have adequate insurance coverage before a tree falls on their car, they may not have many options for being compensated for their losses. In this case, if the tree merely damages the car, the driver can choose to pay, out-of-pocket, for automotive repairs. But if the damage is too extensive for repair, the driver must scrap the vehicle. Fortunately, this will put some cash in their pocket! Call our friendly Indianapolis junk car buyers at 317-450-3721 to sell a totaled car in Indiana. We give the highest payouts for junk cars, boats, motorcycles, boats, and anything else that runs on fuel! When you want hassle-free cash on the spot, call us to get rid of your junk car! Regardless of condition, make, or model, we will pay you cash on the spot! Request a free quote, today. This entry was posted in Wrecked Vehicles and tagged cash for cars indianapolis, liability car insurance, sell a totaled car Indianapolis, total loss vehicle, tree damage car insurance, tree fell on car. Bookmark the permalink.